Thiriving for a Lonely Life? It’s been some time since I last watched a movie. The closest that I’ve done was watching trailers being shared on Facebook. 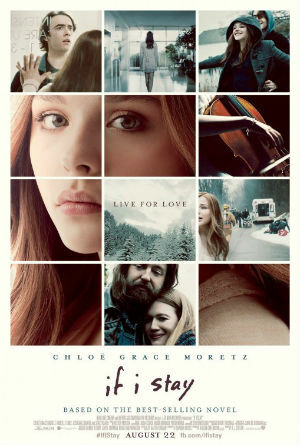 One such movie was If I Stay, directed by R. J. Cutler, and headed by Chloë Grace Moretz. The trailer caught my attention because A Great Big World and Christina Aguilera’s Say Something was on it, and that it seemed to involve having an out-of-body experience, which is a movie theme I haven’t seen in a long time. Based on the young adult novel written by Gayle Forman, it tells the story of Mia Hall (Moretz) who has an out-of-body experience after she, her parents, and younger brother, Teddy, get into a motor-vehicle accident while on the way to visit her grandparents. While she hovers over her hospitalized body, she learns that her mother died on the spot and that her father died while on the operating table. This prompts her to want to recover and to be strong and care for Teddy. Continue reading Thiriving for a Lonely Life? Posted on 2014 September 19 Categories Books, Movies and ShowsTags Chloë Grace Moretz, DiNovi Pictures, Gayle Forman, If I Stay, Metro-Goldwyn-Mayer, New Line Cinema, R. J. Cutler, Where She WentLeave a comment on Thiriving for a Lonely Life?